AbstractIncreasing variability in practice schedules has been shown to slow initial learning but lead to improved transfer after a consolidation period (Shea & Morgan, 1979). The underlying mechanisms for this process are not well-understood and there has been limited exploration of methods by which variability can be imposed during practice. 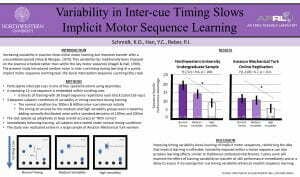 The present study increased training variability by introducing random noise in inter-cue timing during learning of a purely implicit motor sequence learning task, the Serial Interception Sequence Learning (SISL) task. In this task, participants make a precisely timed response to a cue moving down a computer screen towards a target in one of four spatial locations. Participants are not told that a repeating 12-cue sequence is embedded within the task. This sequence has a consistent timing pattern of inter-cue intervals split between short (300ms initially) and long (600ms) intervals. The task speeds up with practice adaptively to each participants’ performance to keep the overall accuracy at ~80% correct and speed changes are reflected proportionally in the short/long intervals between cues. Variability during practice was created by adding normally distributed noise with a standard deviation of 100ms or 200ms during 6 blocks of training with 36 target sequence repetitions each block. Participants were 54 Northwestern University undergraduates randomly assigned to 1 of the 3 timing conditions during training. Sequence knowledge was assessed during a post-training test with no timing variability in which participants saw 3 sequences (1 trained and 2 novel foils) and sequence knowledge was measured as the increase in accuracy (percent correct) for the practiced sequence compared with foils. A one-way between subjects ANOVA of training variability condition revealed a significant linear effect of variability on test performance, F(1,52) = 9.6, p = .003. The normal timing condition (M = 17%, SD = 11%) was more accurate than the intermediate timing condition (M = 12%, SD = 8%) which was more accurate than the high variability timing condition (M = 7%, SD = 9%). 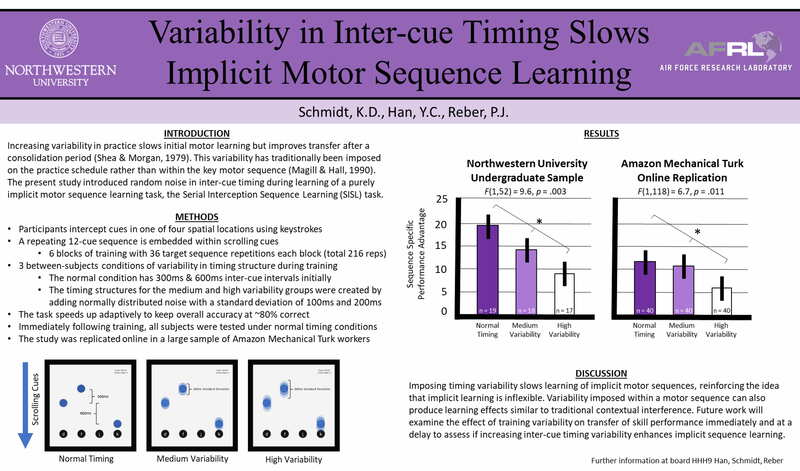 This suggests that imposing timing variability slows learning of implicit motor sequences, reinforcing the idea that implicit learning is inflexible (Dienes & Berry, 1997; Gobel et al., 2011a, b). Future work will examine the effect of training variability on transfer of skill performance immediately and at a delay to assess if increasing inter-cue timing variability produces effects like contextual interference (Shea & Morgan, 1979) on implicit sequence learning.